We Trust in the Name of the Lord Our God! This won't be a long update, but we want to share some disappointing developments with Luke. 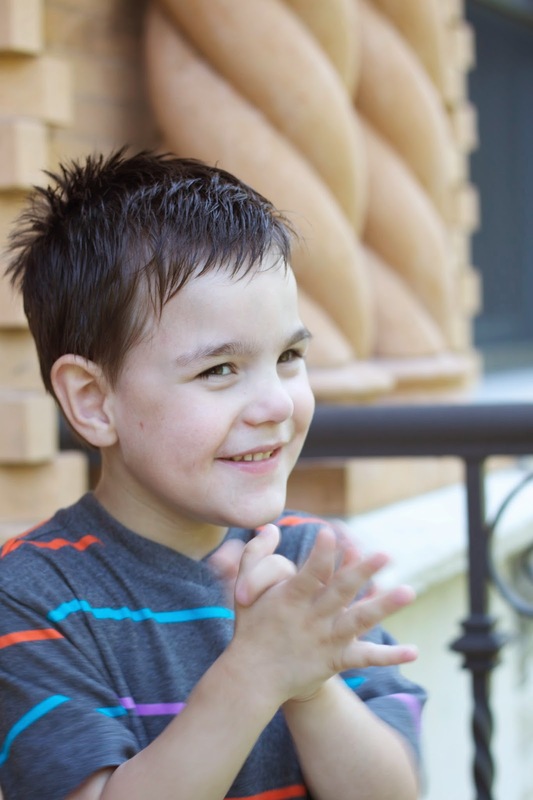 On April 19th (Easter Eve), Luke had a long, severe seizure. He was at home. Actually, I had just left the house and Andrew was at home with all three kids. Luke had been sort of lethargic that day....didn't seem to feel real well. He took a bath and I had gotten him to bed. It was early.... about 5:30pm. But he was sooo tired. He climbed up into his bed and was asleep by 6pm. I checked on him one more time before I left and he was sound asleep. I had been out of the house for about 20 minutes when Andrew called. Never the call I thought I would get. There were various indicators that I won't get into...but by Andrew's estimation, Luke had probably already been seizing for 10-15 minutes before Andrew found him. Andrew had to check Luke's vitals more than once. Suffice it to say, it was a really bad seizure....the kind that had Andrew thinking Luke may have passed. On the phone, the two of us are frantically saying out loud to each other the directions on how to administer the emergency drug. Why didn't we pay better attention when they were showing us how to use this? We never thought we would have to use it. Luke s-l--o-w-l-y started to recover. And by recover I mean fall into a deep sleep. And all we could do was weep. I guess there's no point in sugar-coating any of it. The truth is, we were heartbroken. And devastated. And so very disappointed. And very scared. We eventually got in touch with Luke's neurologist, who said pretty much what we expected. This is too much. This kind of seizure is taking you into a danger zone. It's too much. "You have to medicate", he says. So, we are. Luke's been on a daily antiepileptic drug for about 10 days now. "It's the safest one", doc says. It also comes with possible, significant side effects. We are waiting that out......waiting to see how Luke will react to it. He hasn't been on any AEDs since he was 1 yr old. And, we don't have a good history there. One drug made his seizures worse. Another one had the potential side effect of causing blindness....but it didn't work anyway, so he wasn't on that long. But, I'm reminding myself....that was then and this is now. Luke was having an EnTiReLy different kind of seizure back then. We're in brand new territory now. So, time will tell what will work and what won't. I'm still left with the question of why now? As the doctor rattled on about various things that trigger seizures, I'm just staring blankly back at him thinking Luke's had plenty of opportunities to seize over the last four years...and he didn't. He's had two surgeries, been extremely sleep deprived (he didn't sleep through the night till he was almost 4... most nights he was awake for 2 or 3 hours stretches), been very sick with high fevers, taken two long road trips to Montana. All of these common triggers never once set off any kind of seizure activity. The EEGs always confirmed it for us. They were perfectly normal. We don't know. When the seizures stopped in 2010, it was so out-of-the-ordinary. So wonderfully clear that God had intervened. To have gone 4 yrs with no seizures is truly miraculous! All we do is continue to trust. God is able and we know He is with us. Thank you for praying with us. Luke was really out of it for about 2 days after the seizure. But I was able to catch him in a happy, cooperative mood and he was ready to sing. :) This is him singing a kids song, "We Trust in the Name of the Lord Our God." P.S. I'll keep you updated on this site throughout the coming month (and summer months) about how Luke is doing.